Negative stress causes physiological changes in your body. Because of the implications on your health, it is essential for you to be aware of these physiological changes. Most noteworthy, there are two types of negative stress: acute stress and chronic stress. First of all, acute stress is your body’s immediate reaction to a new challenge - the fight or flight response. However, isolated episodes of acute stress have no lingering health effects (no negative stress). In fact, they are healthy for you, as they stir you to take beneficial action. On the other hand, severe acute stress, such as when you are a victim of a crime or a life threatening situation leads to negative stress such as post-traumatic stress disorder or acute stress disorder. Furthermore, acute stress that isn’t resolved in short time or continues off and on for a long time, becomes chronic stress (a negative stress). And, chronic stress contributes to heart disease, cancer, lung disease, accidents, cirrhosis of the liver, and suicide. First of all, acute stress is a natural physical and mental reaction to life’s unexpected events. Indeed, it is beneficial to your health because it helps you cope with potentially dangerous situations. When you are under stress, the amygdala, an area of the brain that contributes to emotional processing, sends a distress signal to the hypothalamus. Consequently, the hypothalamus activates the sympathetic nervous system by sending signals through the autonomic nerves to the adrenal glands. Furthermore, the adrenal glands respond by pumping the hormone epinephrine (also known as adrenaline) into the blood stream. As the epinephrine circulates through the body, it causes the heart to beat faster than normal, pushing blood to the muscles, heart, and other vital organs. Consequently, the heart rate and blood pressure goes up. In addition, the lungs start to breathe faster. Also, the small airways in the lungs open wide to take in as much oxygen as possible with each breath, resulting in extra oxygen to the brain. Thereby, increasing alertness. Furthermore, sight, hearing, and other senses become sharper. Meanwhile epinephrine triggers the release of blood sugar (glucose) and fats from temporary storage sites in the body. And, these nutrients flood into the bloodstream, supplying energy to all parts of the body. Most of all, these changes happen so quickly that people aren’t even aware of them. In fact, the amygdala and the hypothalamus start this cascade even before the brain’s visual centers have a chance to process what is happening. For this reason, people are able to jump out of the path of an oncoming car. Furthermore, as the initial surge of epinephrine subsides, the hypothalamus activates the second component of the stress response system - the HPA axis. This network consists of the hypothalamus, the pituitary gland, and the adrenal glands. Also, the HPA axis relies on a series of hormonal signals to keep the sympathetic nervous system pressed down like a gas pedal. Therefore, if the brain continues to perceive something as dangerous, the hypothalamus releases Corticotropin Releasing Hormone (CRH), which travels to the pituitary gland, triggering the release of adrenocorticotropic hormone (ACTH). And, this hormone travels to the adrenal glands, prompting them to release cortisol. Consequently, the body thus stays revved up and on high alert. And, when the threat passes, cortisol levels fall. In addition, the parasympathetic nervous system (the brake) then dampens the stress response. First of all, chronic low-level stress keeps the HPA axis activated. After a while, this has an effect on the body that contributes to the health problems associated with chronic stress (a negative stress). Furthermore, the picture shows areas affected by negative stress. The Autonomic Nervous System (ANS) has a direct role in the physical response to stress. First of all, the ANS consists of the Sympathetic Nervous System (SNS), and the Parasympathetic Nervous System (PNS). Also, a stressed body results in the SNS generating the “fight or flight” response. Furthermore, the SNS signals the adrenal glands to release hormones called adrenalin and cortisol. Consequently, negative stress such as chronic stress can result in a long-term drain on the body. And, as the SNS continues to trigger physical reactions to the negative stress, it causes wear-and-tear on the body. When the body is stressed, muscles tense up. This is the way the body guards against injury and pain. Also, with acute stress the muscles tense up suddenly and then release after the stress has passed. While with negative stress such as chronic stress, the muscles are in a constant state of tension. Furthermore, the constant tension triggers other reactions in the body. First, tension and migraine headaches are intensified due to chronic muscle tension in the shoulders, neck and head. Second, there is back, and shoulder pain. Third, there is shortness of breath caused by tensing of muscles that help you breathe. However, relaxation techniques help reduce muscle tension and, decrease the incidence of certain stress-related disorders (such as headaches) and, increases a sense of well-being. Also, stress can make you breathe harder. Furthermore, acute stress triggers asthma attacks (due to constriction of the airways between the nose and the lungs). And, acute stress can cause rapid breathing – hyperventilation – which can bring on a panic attack in someone prone to them. However, relaxation techniques helps reduce these effects. Acute stress causes an increase in the heart rate and stronger contractions of the heart muscle, triggered by stress hormones (adrenaline, noradrenaline, and cortisol). In addition, blood vessels that move blood to the large muscles and the heart dilate for increased blood flow and higher blood pressure. Most noteworthy, once the stress episode passes, the body returns to the normal state. First, chronic stress (a negative stress) results in a constantly high heart rate, elevated levels of stress hormones, and blood pressure. Furthermore, persistent epinephrine surges damages blood vessels and arteries, increasing blood pressure and raising risk of heart attacks or strokes. In addition, the surges cause inflammation in the circulatory system, particularly in the coronary arteries. And, this is one pathway that ties negative stress (chronic stress) to heart attack. Finally, how a person responds to stress affects cholesterol levels. Acute stress causes the hypothalamus to signal the autonomic nervous system and the pituitary gland to produce epinephrine and cortisol (the stress hormones). Consequently, stress signals from the hypothalamus causes the adrenal cortex to produce cortisol and the adrenal medulla to produce epinephrine. So, this starts the process that gives the body the energy to run from danger. When cortisol and epinephrine are released, the liver produces more glucose, a blood sugar that gives you the energy to “fight or flight” in an emergency. The bodies of most people reabsorb the extra blood sugar, even if you are stressed again and again. For some people – those vulnerable to Type 2 diabetes – that extra blood sugar means diabetes. Furthermore, studies show that if you learn to manage stress, you control your blood sugar level. Also, chronic stress (negative stress) increases the risk of having insulin resistance, which may lead to inflammation which can worsen stress symptoms and induce depression. Elevated cortisol levels create physiological changes that help replenish the body’s energy stores that are depleted during the stress response. But they contribute to the building up of fat tissues and to weight gain. This is because cortisol increases appetite causing people to want to eat more to get the extra energy. And, higher cortisol levels also causes an increase in storage of unused nutrients as fat. Furthermore, alcohol use may increase. In addition, the stomach increases production of acid. Consequently, this causes you to experience heartburn or acid reflux. Moreover, stress or exhaustion can increase the severity of the heartburn pain. When you are stressed, your brain becomes aware of the sensations in your stomach. First of all, your stomach can react with “butterflies”, nausea or pain. And, you may vomit under severe negative stress. Furthermore, if the negative stress becomes worse you may experience severe stomach pain. 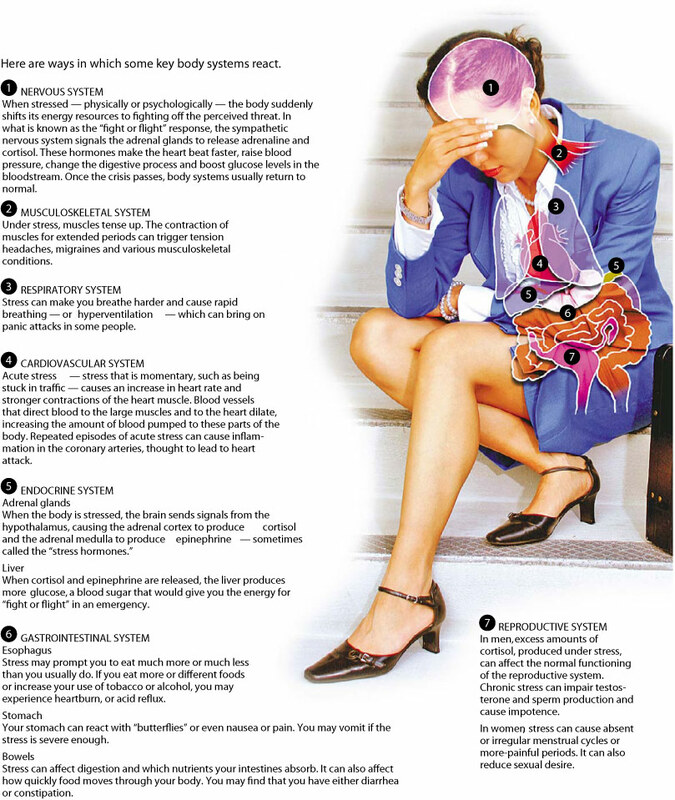 In addition, negative stress can affect digestion by absorbing only certain nutrients in the intestines. Also, it can affect how slow or fast the food moves through the intestines, causing you to have either diarrhea or constipation. First of all, the Autonomic Nervous System produces testosterone and activates the Sympathetic Nervous System which creates arousal. While the Parasympathetic Nervous System causes relaxation. Most noteworthy, cortisol is important to blood pressure regulation. However, excess amount of cortisol affects the normal functioning of the male reproductive system. Furthermore, chronic stress (a negative stress) affects testosterone production, sperm production and maturation, and even erectile dysfunction or impotence. Stress suppresses the hormones that regulate a women’s menstruation causing the women’s period to become irregular or stop. Furthermore, this occurs so that when you are stressed it’s not the optimal time to have a baby and be fertile. Also, high levels of stress result in absent or irregular menstrual cycles, more painful periods and changes in the length of cycles. And, stress may make Premenstrual syndrome (PMS) worse or more difficult to cope with. Also, it can cause cramping, fluid retention and bloating, negative mood (feeling irritable and “blue”) and mood swings. Chronic stress (negative stress) weakens the immune system and reduce the body’s response to foreign invaders making you more susceptible to viral illnesses like the flu, the common cold and other infections. Most noteworthy, acute stress stimulates the immune system to help you avoid infections and heal wounds, necessary to deal with the dangerous situation. Our hard-wired stress response gives us the quick burst of heightened alertness and energy needed to perform our best. But stress isn’t all good. When activated too long or too often, stress can damage virtually every part of our body. 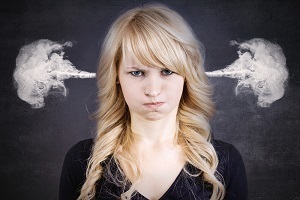 Sharon Horesh Bergquist gives us a look at what goes on inside our chronically stressed body. In conclusion, chronic stress (a negative stress) results in physiological changes that harm your body. Therefore, you need to take steps to get relief.